Definition at line 163 of file FrontendActions.h. 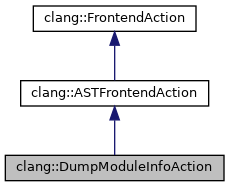 Definition at line 684 of file FrontendActions.cpp. Definition at line 319 of file FrontendActions.cpp. Definition at line 691 of file FrontendActions.cpp. 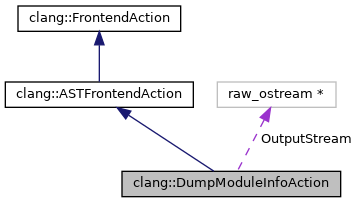 References clang::FileManager::getBufferForFile(), clang::FrontendAction::getCompilerInstance(), clang::FrontendAction::getCurrentFile(), clang::CompilerInstance::getFileManager(), clang::CompilerInstance::getFrontendOpts(), clang::CompilerInstance::getPreprocessor(), clang::HeaderSearchOptions::ModulesValidateDiagnosticOptions, clang::FrontendOptions::OutputFile, and clang::ASTReader::readASTFileControlBlock(). Definition at line 172 of file FrontendActions.h. Definition at line 174 of file FrontendActions.h. Definition at line 173 of file FrontendActions.h. Definition at line 171 of file FrontendActions.h.